The Jovell, a 428-unit residential development along Flora Drive, will open its showflat for preview this Saturday (15 Sept). The 99-year leasehold condo is being developed by Tripartite Developers Pte. Ltd, comprising Hong Leong Holdings Limited, City Developments Limited and TID Pte. Ltd. The company owns over three million square feet of land in the Upper Changi Road North area and has built several projects there, including Ferraria Park and The Inflora. The Jovell is the latest development and will sit on a 242,558 sq ft site that will comprise nine eight-storey blocks of one- to four-bedroom apartments. Unit sizes range from 441 sq ft to 1,270 sq ft, with prices starting from $585,000 for a one-bedder. The island resort-themed condo will feature a continuous 200-metre long waterscape with a rope island and pool island that incorporates a rope bridge, Jacuzzis, lounge pavilions and sun decks. 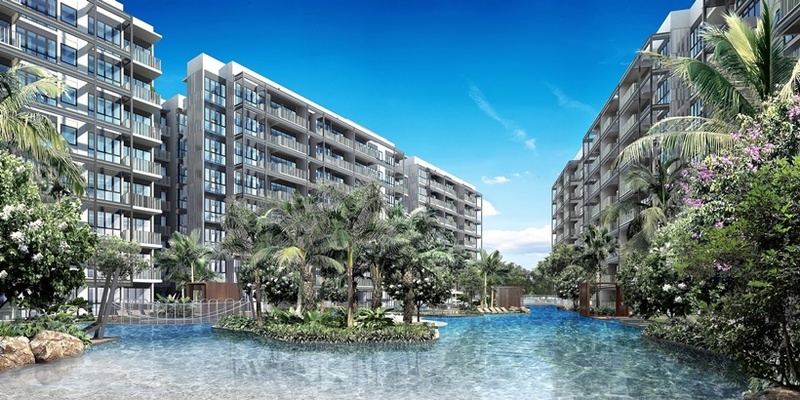 Situated near the new Tampines East MRT station, the development will be close to numerous schools and retail outlets such as the Japanese School, Temasek Polytechnic, Tampines Mall and Jewel Changi Airport.